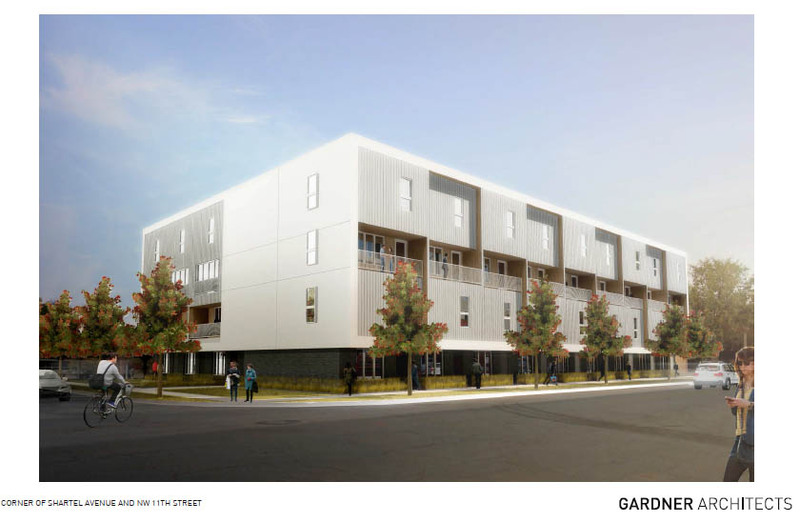 Milhaus, an Indianapolis-based developer of urban apartment properties, is planning its second project in Oklahoma City. Dubbed L2, the 27 units will be a companion to the under-construction LIFT directly to the west. 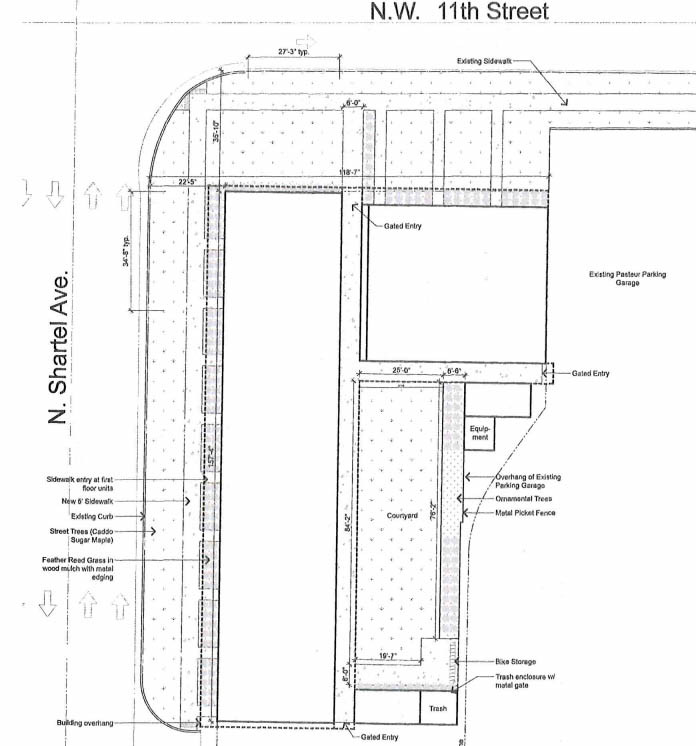 L2 will be constructed in an L-shape on a surface parking lot on the southeast corner of NW 11th Street and Shartel Avenue, adjoining the Pasteur Building and its parking structure. The 4-story buildings comprising 36,800 square feet will feature one, two and three bedroom units. The design by Gardner Architects calls for brick veneer on the first floor. LIFT hopes to open its first units before the end of the year as the large complex will be completed in multiple phases. The addition of L2 represents yet more living units in a booming Midtown area. 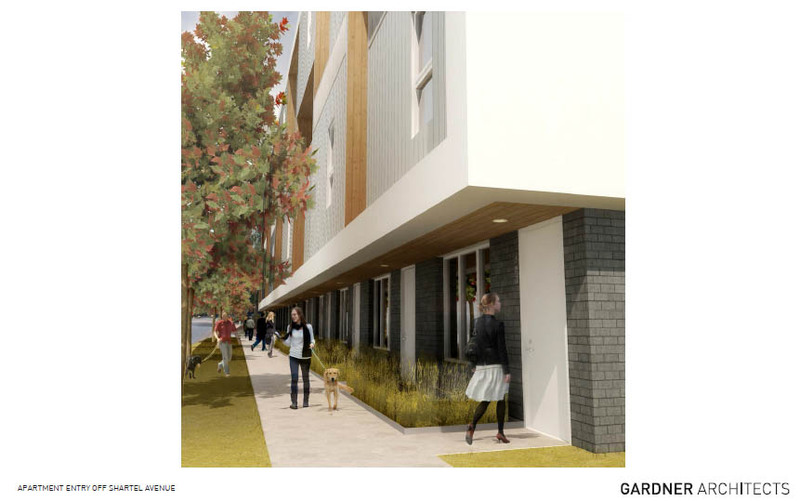 In addition to the 329 units at LIFT, The Frank is well under construction and will offer 43 units, Lisbon Lofts is wrapping up to the south with 7 condominiums and The Edge recently completed 252 apartments. For a complete breakdown of all the downtown housing projects completed, under construction and planned, see our comprehensive summary. It seems like just about every day there is a new development announced. Dang, too many developments to keep track of! I hope they find a way to spruce up the western-portion of the north elevation…It's blandness at the corner, which is never a good thing. Other than that, looks excellent. Nice to see them incorporate an already existing garage for the development. Super happy to have Milhaus in the market! 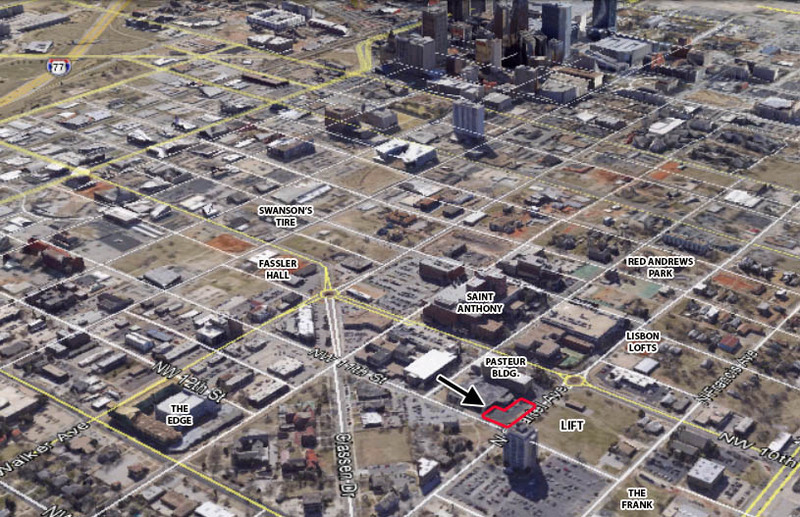 Here comes another dense urban canyon for OKC. Oh man, I completely forgot about this. There are issues with the plan to build this so close to the existing parking garage, and variances would have to be obtained. However, the guy that Milhaus brought in to help aid future development has now been transferred to another city and I'm not sure they are still planning to go forward with more projects in OKC. They took a run at several and couldn't find anything that fit their model (i.e. full return in 7 years or less). So, basically... the project is dead? That's disappointing. Just no longer definitely going to happen. I heard from several guys that worked on their last job site that Milhaus is a PITA to work with. Well I hope it does end up happening. I thought how awesome it was that they were infilling these small, awkward lots next to this parking garage. It would really change the dynamic of the area, by further complementing all the residential going on while also adding density and hiding the parking structure. At least now we know not to get our hopes up. Sorta disappointing because I feel these lots won't be developed otherwise; but what do I know! At this point, it may not be a bad idea to take a breather on the amount of new rentals coming online.